Here is a picture of the Avatar, The Last Airbender costume. It is also sometimes called Avatar, The Legend of Aang. That's who this picture and costume are...Aang. 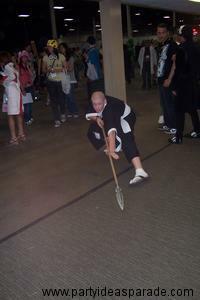 It was taken at one of those AnimeNext conventions by me. Yes, I went to see what all the fuss was about and I have to confess, I loved it. It was fun to see these kids so into their favorite characters. There were so many interesting and creative costumes and everyone seemed to be having such a good time. I wasn't sure about going to one but now that I did...I will be back. It was a pleasant surprise and I saw a lot of custom costumes and some homemade ones too. People certainly put a lot of effort into creating the look of their characters. It was an eye-opening experience for me and I really enjoyed myself. Can't wait until the next one comes around. You can find some Avatar, The Last Airbender costumes at our Airbender costume page. Join in and write your own page! It's easy to do. How? Simply click here to return to Halloween Costume Pictures.